Now you can watch as well as listen as world-renowned physicist Stephen Hawking expounds upon his latest ideas about the knotty black hole information paradox, playfully illustrated by chalkboard artist Andrew Park. 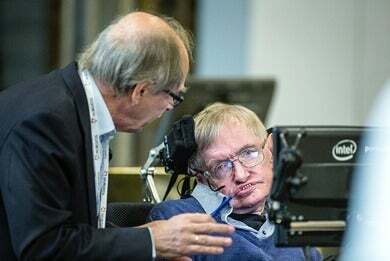 Hawking recently joined a long line of illustrious figures who have given the annual BBC Reith Lectures, founded in 1948, with the very first lectures in the series delivered by Bertrand Russell. And naturally he chose to talk about black holes, specifically the paradox created by his assertion in the 1970s that black holes give off radiation that causes them to gradually evaporate. The smaller the black hole, the faster this happens. This has implications for whether or not it’s possible to retrieve information that falls into a black hole. Hawking assumed it would be lost. “Not only does God play dice, but he sometimes confuses us by throwing them where they can’t be seen,” he famously declared. This is fine in the sphere of general relativity, but quantum mechanics holds that information must always be preserved. Hence the paradox. At the time, his ideas amounted to a short note posted to the arXiv, rather than a full paper, but he did say he was collaborating with Harvard string theorists Andrew Strominger and Malcolm Perry on a complete solution. That paper appeared on the arXiv last month, offering tantalising new details — at least for those able to parse the incredibly technical content. Fortunately Strominger translated a few things in a lengthy Q&A for Scientific American.